Wind energy provides economic, environmental, and health benefits to Wisconsin and our citizens. We can produce wind power here in Wisconsin as opposed to sending money out of state to buy coal or natural gas. And, wind power has zero air pollution or carbon emissions which benefits both our environment and everyone’s health. The cost of electricity from new wind power projects has dropped by 69% in the past nine years according to Lazard, a financial company. Wind turbines today are more productive than ever, enabling this technology to become more widely deployed in Wisconsin and across America. The benefits of wind energy along with the technological advancements and cost reductions have led to an upswing of interest in wind energy development in Wisconsin. 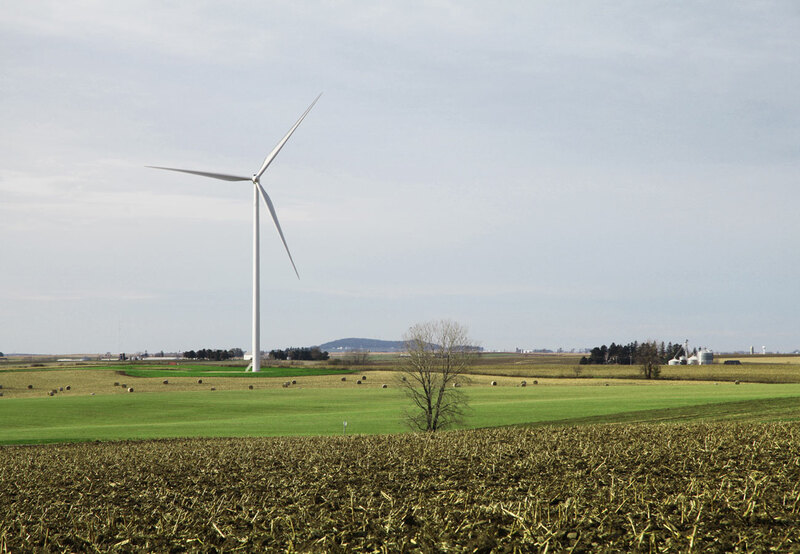 Below, we’ve answered a few questions about Wisconsin’s advancing wind energy landscape. A wind farm is a cluster of wind turbines that generates electricity in bulk to serve many customers, as opposed to a single business or farm. Their sizes can vary greatly. 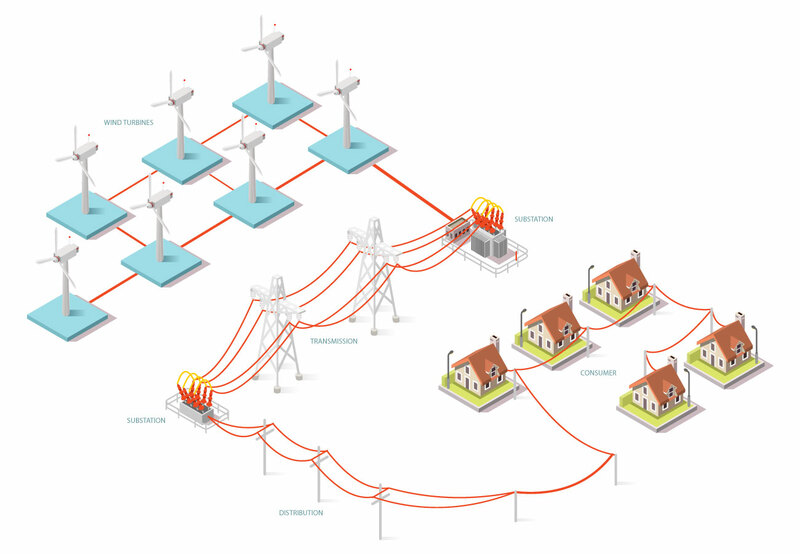 Wind farms are typically located on open land and close to a point of interconnection with the electric transmission system. How loud is a wind turbine or a wind farm? All sound is measured in decibels. A difference of 10 decibels correlates to a sound being twice as loud or soft. A typical wind farm operates at 50 decibels during the daytime, which is actually twice as quiet as an average conversation you might have with someone 3 feet away from you. What accounts for the accelerating growth of large-scale wind energy today? The two most important drivers behind the growth of wind power are improving productivity and declining costs. Compared with projects built 10 years ago, the cost of electricity from a typical wind farm is 69% lower (Lazard, 2018). These trends are encouraging developers to locate new wind farms in the Badger State and bring them closer to the markets served by Wisconsin’s electricity providers. Why are today’s wind turbines more productive? Large wind turbines today are both taller and have longer blades than they did 10 years ago. With taller towers, the turbines are able to access stronger and steadier wind speeds higher in the air. The taller turbines also allow the blades to be longer, which increases each turbine’s “swept area,” the zone where flowing air comes into contact with the blades and causes them to spin. As a matter of physics, power production goes up 8-fold for every doubling of the average wind speed. Who uses the electricity from these wind power projects? Wisconsin does! Thus far, all the utility-scale wind farms operating in the Badger State are either owned by, or sell their electricity to, Wisconsin electricity providers, which provide the electricity to Wisconsin customers for use in our homes and buildings. How do wind farms benefit landowners? In exchange for land needed to accommodate wind turbines and supporting infrastructure such as access roads, developers pay landowners for the use of their property. These are voluntary arrangements. Lease payments provide a stable income stream that helps agricultural producers weather fluctuations in crop production and commodity pricing. Additionally, a typical wind farm uses only one to two acres per wind turbine, leaving 98% of farmland available for crops or pasturing. How do wind farms benefit local governments? In Wisconsin, owners of wind farms greater than 50 megawatts (MW) pay annually into a utility local aid fund which is shared with the local governments where the wind farm is located. Under the revenue sharing formula in place, a qualifying wind farm will contribute $2,333 per MW to the county and $1,667 per MW to the township(s) hosting the project, for a total of $4,000 per MW per year. A 100 MW wind farm would contribute $400,000 per year to host townships and counties. Wind farms operating today contribute more than $2.7 million to local jurisdictions in Wisconsin each year. Who regulates wind energy systems in Wisconsin? Depending on the size of the wind energy project, regulatory authority in Wisconsin is divided between local governments and the state’s Public Service Commission. The dividing line is 100 megawatts (MW). If the project’s maximum generating capacity is less than 100 megawatts (MW), regulatory authority resides with the local governmental unit where the project would be located. However, if the project equals or exceeds 100 megawatts in capacity, then the Public Service Commission of Wisconsin (PSCW) assumes jurisdiction over the facility. In those cases, the PSCW’s permitting authority preempts local land use and zoning ordinances. How do the PSC’s wind siting rules (PSC 128) work? Wis. Admin. Code § PSC 128 establishes the formal process that all local governments must abide by when reviewing permit applications for wind energy projects under 100 MW. The rule also set standards that local governments may apply to the placement of wind turbines as well as their construction and operation. Local governmental units have the option of adopting, for example, setback distances that are less stringent than the baseline standards in PSC 128. However, they may not impose standards that are more stringent than those specified in that rule. What setbacks do the wind siting rules establish? Under the current rules, a local government may require a large wind turbine to be set back to 1,250 feet from a neighboring residence, if that neighbor is not also a wind turbine host. Such neighbors are allowed to waive the setback distance. A local government may also establish sound and shadow flicker standards to the maximum levels specified in PSC 128. There may be situations where meeting the shadow flicker or sound standards results in a turbine being situated farther away from a neighboring residence than 1,250 feet. It is important to note that PSC 128 regulates the wind project developers, not private landowners that live in the vicinity of a wind project. For instance, a private landowner whose property is within the setback distance from a wind turbine has every right to construct a building or home within that setback distance if the landowner so chooses (subject to any other local zoning or necessary permits related to that structure). What is shadow flicker and how can it be minimized? Shadow flicker occurs when wind turbine blades cast shadows that move across the ground and nearby structures. People who experience shadow flicker for long periods of time are likely to find it annoying. However, shadow flicker is easily modeled and can generally be avoided with proper siting. Curtailing operation during the time window when this phenomenon is occurring is a simple solution. Alternative measures such as window coverings and strategic tree plantings are also helpful. What are the sound and shadow flicker standards that a local government may specify? For sound, the maximum thresholds that a local government may set are 50 decibels (dBA) during the day and 45 dBA at night. For shadow flicker, a local government may prohibit a large wind turbine from producing shadow flicker more than 30 hours per year, and may require a wind turbine owner to mitigate shadow flicker that occurs more than 20 hours per year. Neighbors are allowed to waive these standards under a written contract. Does a local government need to have a wind energy ordinance? No, a local government is not required to have a wind energy ordinance. A local government may adopt a wind ordinance as part of its permitting authority for projects under 100 MW, but it is not mandatory. By statute, the political subdivision has a defined period of time to consider and adopt a wind energy ordinance. If a wind farm developer has filed an application to build a wind project, a local governmental unit has 90 days from the date of the application to adopt a wind energy ordinance and an additional 90 days to review and approve the proposed project. Are wind farms a threat to local wildlife? Among clean energy resources, wind is one of the most compatible with wildlife. Wind power is far less harmful to wildlife than traditional energy sources it displaces — including to birds and their critical habitats. It is one of the only energy sources without population-level impacts, such as climate change-related habitat loss. Nevertheless, the wind industry has taken a systematic approach to identifying potential impacts on birds, bats and other wildlife, and is engaged in initiatives to reduce those impacts. Do wind farms benefit the environment? Yes, absolutely! There is an abundance of analysis documenting wind energy’s minimal impact relative to other forms of energy production. Wind power emits no air or water pollution, requires no mining or drilling for fuel, uses no water in the generation of electricity, and creates no hazardous or radioactive waste requiring permanent storage. How many wind farms are operating in Wisconsin today? There are 10 wind projects in Wisconsin that are presently generating electricity for utility use. The oldest projects started operating in 1999, while the newest, EDP Renewables’ Quilt Block project in Lafayette County, started operating in 2017. Combined, these projects contain 437 wind turbines and total 737 MW. With today’s wind turbines, one MW in Wisconsin produces enough electricity to offset consumption from about 350 typical Wisconsin homes. Do wind farms negatively impact property values? The most comprehensive study on wind farms and property values to-date was conducted by the Lawrence Berkeley National Laboratory (LBNL). The study analyzed more than 50,000 home sales near 67 wind facilities across nine U.S. states over ten years and found no statistical evidence that operating wind farms have had any measurable impacts on home sale prices. Other studies performed in the United States and Canada confirm LBNL’s finding. These results are summarized in a recent South Dakota utility commission proceeding involving a proposed wind power plant. Can wind generation and aerial spraying coexist? Crop dusting pilots routinely fly near trees, power poles and wires, and other obstacles. Many will fly over land near wind turbines, though some may charge extra for the service. In negotiating land leases with wind farm developers, host landowners have the ability to negotiate provisions that ensure access to aerial spraying and the continuation of other important farm management practices. If those provisions are mutually acceptable, wind farmers will accommodate those host landowners. Do wind farms have an effect on human health? Wind energy is environmentally-friendly, affordable, and benefits our communities. Studies also show it is a safe way to generate electricity. A growing number of scientific, medical, and acoustical experts have studied wind turbines and health around the world and authored more than 25 comprehensive reviews on the potential health effects. The balance of scientific evidence and human experience to date clearly concludes that wind turbines are not harmful to human health. In fact, wind energy provides electricity without emitting greenhouse gases or air pollutants, and uses no freshwater to generate electricity – creating a healthier environment for people and wildlife. A review of 60 research studies conducted worldwide on wind turbines and human health was published in the Frontiers in Public Health in June 2014 and the authors concluded that the weight of evidence suggests that when sited properly, wind turbines are not related to adverse health effects in humans though they may be source of annoyance for some people. A recent report by the Iowa Environmental Council (IEC) found no evidence to support claims of health problems caused by wind turbines. “With the rapid expansion of wind energy, some neighbors to wind turbines have claimed the sound has affected their health. While – to some – the sound might be annoying, research studies have established no adverse health effects,” said Peter Thorne, a professor and head of the University of Iowa Department of Occupational and Environmental Health. A link to the report can be found on the IEC website. Wind Turbines and Health: A Critical Review of the Scientific Literature is a 2014 report commissioned through the Massachusetts Institute of Technology (MIT) that provides a comprehensive and multidisciplinary review of scientific literature on wind turbines and human health. Wind Turbine Sound and Health Effects: An Expert Panel Review (Executive Summary) to the Massachusetts Department of Public Health found that “there is nothing unique about the sounds and vibrations emitted by wind turbines” and that “there is no evidence that the audible or sub-audible sounds emitted by wind turbines have any direct adverse physiological effects”. Study results by Simon Chapman, professor of public health at Sydney University, suggest that health problems attributed to wind energy are a ”communicated disease” – or a sickness spread by the suggestion that something is likely to make a person sick. This is caused by the “nocebo effect” – the opposite of the placebo effect – in which the belief that something can cause an illness creates the perception of illness. Read summary of main conclusions here. In 17 Canadian separate hearings, “courts found that wind farms would not and do not cause health impacts,” says a 2014 review by the Energy & Policy Institute. Have another question about wind energy? Please contact Heather Allen and she’ll get you an answer!